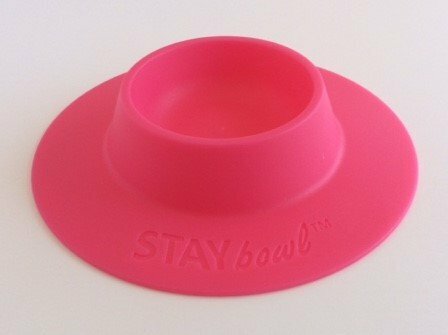 STAYbowl™ is a tip-proof, patent-pending food bowl with an ergonomic design that allows guinea pigs and other small pets to get the proper nutrition they need. STAYbowl™ not only keeps your pets' food off the cage floor, it also save you time and money. Because there is no more wasted kibble, this bowl will literally pay for itself! Keeps food clean and off the cage floor! Saves time -- Less cage mess! Saves money -- No more wasted kibble! Promotes health and wellness -- No more over- or under-feeding! In the first 10 minutes with the StayBowl, our 2 boys, Niblet and S'mores tried to lift it, flip it, and push it down the ramp from their food area. When they realized none of their usual tricks would work, they settled on just eating out of it. It definitely works. Babbette always tipped our old food bowl on its side so she could eat in a fully reclined position while making a huge mess. This bowl has fixed that issue! Food stays in the bowl, and no one can drag the dish under the water either. I love it! Thank you! I love this bowl! I was unsure at first. I thought for sure my piggy would find a way to tip it over but it really works. She hasnt been able to tip it yet abd actually eating her food. The cage looks so much cleaner without food scattered everywhere. This is the only dish that I've ever found that my guinea pigs won't tip over! I love it! My little piggy loved to flip his bowl, I truly think he got enjoyment out of spilling his food but he doesn't have to pay for it! Lol the staybowl has been perfect so far for my Joey and he hasn't even attempted to flip it! Plus I love how it's size is correctly portioned for the amount of food he should get! 10/10 would recommend to anyone with a piggy or small animal who enjoys flipping their bowl! We bought one to try out for our little furbaby crew. It is brilliant. It has worked out GrEat...(ha ha). Our girls get to enjoy the full serving of pellets without any waste. High quality organic food does not come cheap so we are super pleased to be a happy customer! Thank you. I have four guinea pigs and they all love to tip over or even flip their bowl completely over. One time they dragged it on top of their house. No idea how they did that. With SAY bowls now bowls just hold pellets. No more spilled and wasted food. Thank you. Thank you. As a bonus, the bowls are easy to wash. I had a ceramic bowl that was supposed to be tip-proof but my one pig Dwight quickly proved it wrong. He would tip his bowl every day and waste so much food. The Stay Bowl has been great though. No tipping at all, and it's just the right size to fill once a day for my two boys. This is the ONLY bowl my Guinea Pig hasn't been able to flip over. The price is more than reasonable. I wish I had this bowl when I adopted my Guinea pig a year ago because I would have saved so much money on pellets. I do everything myself, so you may have to wait for your order, but this ensures that all items are made to the same high standard.